n this futurist story written by the popular Canadian humorist Stephen B. Leacock (1869-1944) there are observations of human nature which are as refreshing today as when they were written in 1911. 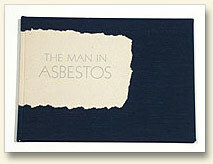 Leacock describes a world where the inhabitants are clad in long-wearing suits of asbestos; where death has been eliminated, although a person can be broken; and where only a vestigal memory of Work remains, anything requiring effort was accomplished centuries agoin short, a perfect world. This utopia is illustrated in this edition by photo-engravings of drawings by Jan Vredeman de Vries, the Dutch architect, painter, and engraver of the 16th century. His drawings show us a perfectly ordered world and serve as a flawless backdrop to Leacock's future world. Additionally, photo-engravings of drawings by Peggy Gotthold have been made to describe the character of the Man in Asbestos. This, the premiere edition of Foolscap Press, is limited to 150 copies. The book is 48 pages, 6 5/8 x 9 inches oblong and is printed letterpress on Mohawk Superfine paper on a Hacker Hand Press. The type is set in Monotype Sans Serif and the books are bound by hand in Japanese cloth over boards.